Turkey is a honeymoon no-brainer. It’s a four-hour flight with a fabulous climate, stunning coast and a heritage to rival any destination. The stylish adult-only Mandarin Boutique Hotel has just eight rooms with king-sized beds and Jacuzzis for two. With delicious organic cuisine on the menu, it's both gorgeous and affordable. 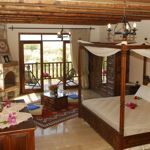 Even in such popular and easy-to-access holiday destinations as Turkey, couples can still escape the tourist crowds to find somewhere truly special and unpretentious for their honeymoon. We think we’ve found just the spot. Mandarin Boutique Hotel is a romantic hideaway set in unspoilt countryside. 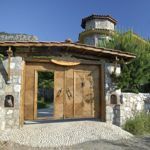 It’s hard to believe that it is located just a short drive from the popular resorts of Fethiye and Oludeniz. With just eight rooms, the ambience is personal and intimate, and the hotel’s strict adults-only policy ensures that you can enjoy the views from the enticing swimming pool in complete peace. Attractively appointed with local marble and hand-carved wood furnishings, all the double rooms boast kingsize four-poster beds and a Jacuzzi for two. Enjoy breakfast in the privacy of your private terrace (no extra charge) and delicious five-course dinners based on organic local produce and traditional Turkish recipes, all served by candlelight on the raised terrace. Many guests find it hard to leave this tranquil haven, but there’s plenty to explore – walk some of the ancient Lycian Way, take to the sea in a traditional Turkish gulet, visit the UNESCO World Heritage site of Xanthos or kayak through the Saklikent Gorge for example. Alternatively, combine a relaxing stay at Mandarin with a few nights in vibrant Istanbul, or in the mythical landscapes of Cappadocia, where the Museum Hotel is another romantic gem. If Mandarin appeals, check out our other rural hideaways too, such as the splendid Hacienda de Abajo on the unspoilt Canary Island of La Palma, the stylish Hotel Villa Kerasia in Crete or the opulent Argentikon Suites on the little-known Greek island of Chios. Find out more about the Mandarin Boutique Hotel.